An FM Radio and Tiny Portable Speaker All in One? You're Nuts. If you've ever been walking through the forest and thought the acorns were speaking to you, it turns out you might be right. Those lithium treatments still might be a good idea, since that pink elephant in the corner really can't be seen by everyone, but the acorn thing is one little bit of crazy you can cross off your list. Seemingly dropped directly from stately branches and found nestled in cool and shady glens comes the Motz portable speaker and FM radio. And yeah, it looks like an acorn. Retailing at $35.99, this handcrafted audio knick-knack is made out of actual wood and cut apricots. No word on if it smells pine or apricot fresh, but we suppose that we can make due even if it come sans scent. 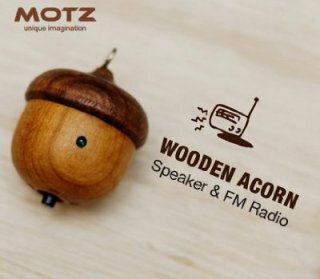 The Motz Tiny Wooden Speaker, as it is known, includes a rechargable lithium polymer battery as well as a headphone jack which can also be used for iPhone or iPod connections. Plus, it's a speaker. A freaky, wooden speaker that apparently puts out some decent sound. The Tiny Wooden Speaker will go 10 hours with the headphones in on a charge, and 5 hours if being used as a standalone speaker or aux speaker for a device. Oh, and as we mentioned – it's also an FM radio with channel-scan capabilities. Kudos to the makers for a slick fusion of the natural and the synthetic, and the natural wood/nut design gives the Motz Tiny Wooden Speaker a classy look. As well, at only 15g and tiny enough to be held in even the smallest hands, it certainly lives up to any measure of portability. Is it cool? Absolutely. Is it ridiculous? Just a bit, but that's part of what makes it great. If you're interested in one, here, go nuts.